What Do You Know about Moot Court Competitions? Moot court or pseudo court is a place where our students can study the practical aspect of law, especially with regard to the practice of the process of a trial. More importantly, students will also learn about how to present a case before the court, not only reading it from textbook. As the name implies, moot court is a simulation of a real trial process. Indonesia, there are many moot court competitions in which law students can compete. Almost all law schools in the country have their own competition. In order to compete, participant needs to prepare everything with regard to the simulation. This preparation includes but not limited to, trial documents (memorials, pleadings), role playing (judge, lawyer, solicitor, witnesses, etc. ), dialogue, scenario and a lot more. That being said, participant needs to have a time frame to prepare all that is necessary before entering a competition. Let’s start with the trial documents that participants need to prepare for the moot court competition. Usually, it could take up to three months to prepare all documents necessary for the competition. There is no doubt that writing a legal document, memorials for example, is not an easy stuff to do. In the writing process participant also needs to think about the charges that will be given to the defendant, preparing dialogue for the witnesses and so on. Other than that, in a moot court competition participants are also required to analyze the case that is already prepared by the committee. This is one of the most important processes of a moot court competition, since in this phase, participant will use their legal skill to analyze the case, interpreting the law and conducting legal research. In order to better analyze the case, participants need to be equipped with critical thinking since it is usual to find legal loopholes in a moot court case. These legal loopholes are intentionally created by the committee of the competition to test participant with regard to its knowledge of the law. 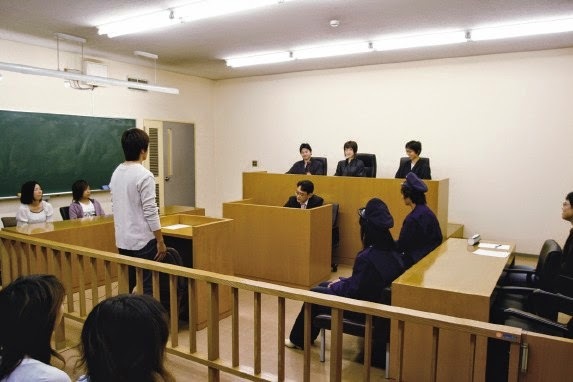 A moot court competition is usually divided into two stages, namely preliminary and final round. In order to advance to the final rounds, participants have to be able to make the highest score possible while competing in the preliminary rounds. In the preliminary rounds participant will present their “moot court” by playing role as if in a real court. These role playing and trial documents will be scored by judges of the competition. The judging is process is also something that participants need to think about. This is due to a wide variety of judges prepared by the committee. Usually the judge bench will consist of four components, namely, real judges, real prosecutors, real lawyers and academicians. Usually the most important thing in a moot court competition is the completeness and the format of the trial documents that are need to be prepared by participants. Therefore, in order to get maximum point from the judges participants are required to oblige with the specific format, wording, margins which has been set out by the committee. In the end of the day, moot court is a very good place for our young generations of future judges, solicitor, and lawyers to learn more about the practical side of law, with the hope that it will one day contribute to the betterment of our “real” legal system in Indonesia. It is indeed unfortunate to see the reality of judicial proceedings in Indonesia that currently exist in its critical time. At a point it might make you think that the system is full of crooks. Notwithstanding, one should understand the importance of law supremacy in a state in order to make sure the prosperity of its people and to give justice for those who seek. Therefore it is necessary for the State and the government to build a justice system that is clean, a system which accommodates the application of the judicial trilogy, namely, simple, easy and cheap. Now, the question is where should people seek justice if the system is corrupt? There has to be a way out of this unacceptable condition. And hopefully our young generations will be able to find that way.